Articles about why roller shutters are great, including how homeowners benefit from having roller shutters and industry hints and tips for getting the most out of roller shutters and your home. 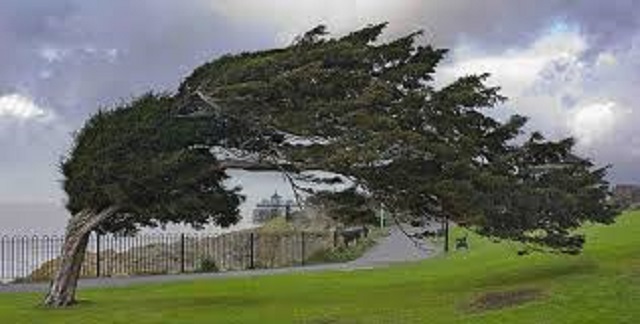 As I’m typing, Adelaide is being lashed with winds up to 60km per hour, with a possible thunderstorm developing throughout the afternoon. Even if I couldn’t see the trees nearly bent sideways out the office window, I’d know there was wild weather in Adelaide judging by the number of panicked calls we’ve received today from people whose shutters have been blown off their walls. Yep: blown – off – the – walls! In weather like this where very heavy wind is hitting the home, we strongly recommend roller shutters be either completely rolled up, or completely rolled down. Leaving a shutter partially rolled up provides an avenue for a gust of wind to funnel into and potentially lift the curtain – or the whole shutter – away from the wall. Don’t be too worried though; roller shutters will generally only ever come away from the wall if they are oversize width-wise, have been left partially open in high gusts of wind, or have been very poorly installed. If you have shutters affected by today’s weather please give us a call on 8447 3443. We now have a few extremely busy days ahead however we will give you what advice we can over the phone and schedule a time asap to get out and have a look at any damage. While perhaps not a concern for metropolitan Adelaide homes, we don’t have to travel far from suburbia to be in fire danger areas in this South Australia. We can assist with bushfire rated roller shutters – if you have any queries please call (84473443) or email us (contactus@trsrc.com.au). Ouch! 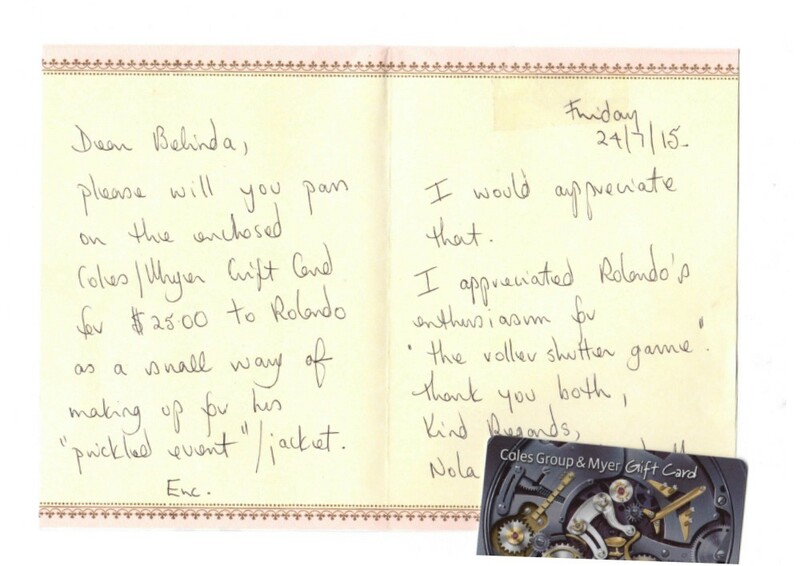 And so to thank Rolando for his enthusiasm and commitment to fixing her roller shutters, our appreciative customer sent across this lovely note – and a gift card! 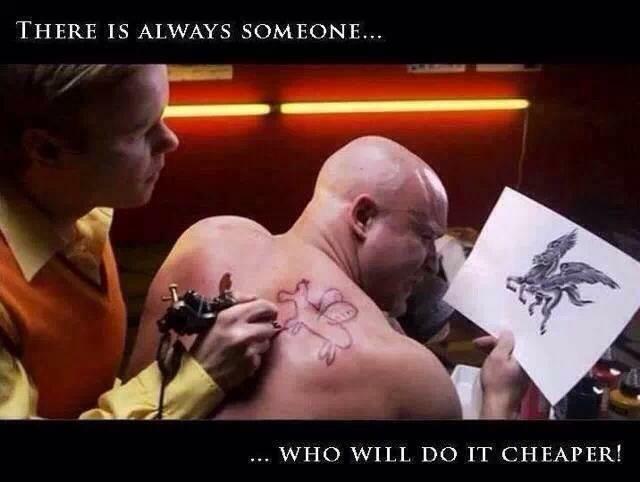 It’s a lighthearted picture but I think there’s some truth to it as well! (And no, I don’t mean to say we’re in the business of drawing any kind of winged horse on roller shutters)! 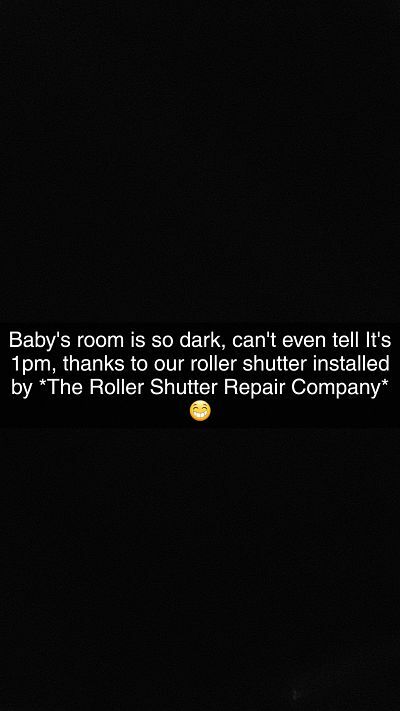 Shutter Rejuvenation – Chapter 4, The Curtain! Our last few posts have covered some of the options you have for brightening up the look of older shutters. Good roller shutters should last decades; if you need to update the look of your shutters, don’t scrap a robust shutter altogether, give it a facelift! 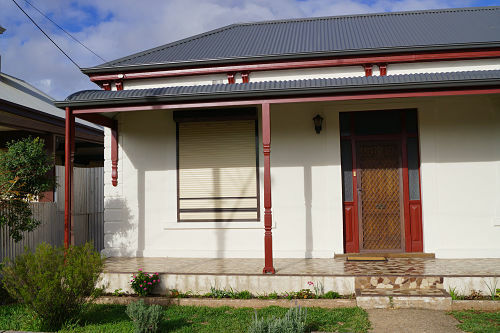 What to do with these perfectly good – but no longer matching – roller shutters post renovation? 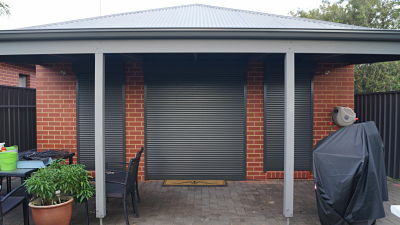 The ‘curtain’ of a roller shutter is the whole ‘sheet’ of aluminium slats in the centre of your shutter. 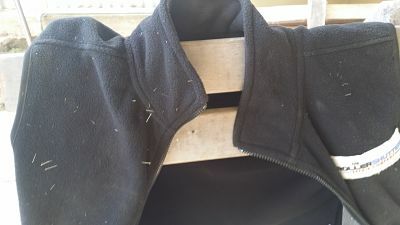 It takes up the most room and is where any damage or different colouring is therefore most obvious. People often aren’t aware that you can change a whole curtain of a roller shutter; yes, we can! This is a great option for shutters that are now out of place against your existing colour scheme, or for shutters that have been damaged/weathered excessively and our earlier tips for touching up and hiding just won’t cut it. Replacing a curtain, and just painting the surrounding border (and doing it well! ), can practically give you a brand-new looking shutter at a fraction of the price. By changing the curtain in it’s entirety, you can also chance the profile of your shutter. At the moment the trend is toward a minimalist, clean line; you can change an older double line shutter for a smooth single line profile with just a simple curtain change. A new curtain will also allow you to take advantage of today’s excellent protective paint finishes. Our slats are all finished in PU/PA – polyurethane/polyamide, which provide an excellent abrasion resistant finish. If you’re in the Adelaide area and would like our help on your roller shutter rejuvenation project, give us a call on 8447 3443. We can fit replacement slats, partial or full curtains to roller shutters and provide advice on colour and finish. Happy renovating! Shutter Rejuvenation – Chapter 3, Borders! In our last posts, we covered some options for removing old ‘accent’ strips from roller shutter curtains. Chances are, if you’ve got a roller shutter with accent slats, those slats probably match the “border” of the roller shutter: the pelmet box, guides and bottom bar. After a gorgeous roofing and verandah renovation, rejuvenating these shutters would make the front shine! 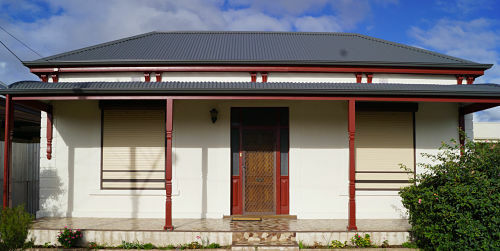 The previous brown guttering & trim was changed to red; the brown shutters now look somewhat out of place. While we forbid you to think about painting the curtain of your roller shutter, the outside borders are another matter. If you really need to spruce up a shutter, you can – WITH CARE – paint the pelmet, guides and bottom bar. The pelmet and guides are static and so won’t suffer from scratching and sticking problems that may occur when a curtain is painted. 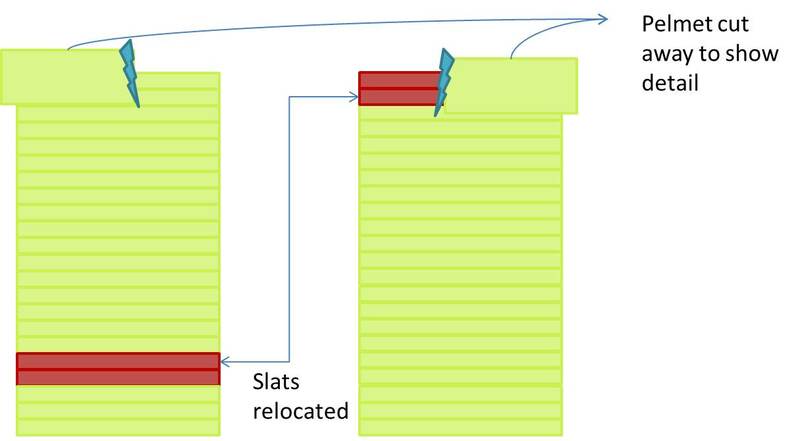 Although the bottom bar is part of the curtain, it’s the absolute last slat in the curtain, so it doesn’t actually come into contact with other moving parts, even when fully retracted. So you can safely paint the bottom bar as well. While we are giving you guidelines here on what can be done to rejuvenate a shutter, please bear in mind that it’s up to you to ensure that the proper usual painting precautions are undertaken; for example, masking the windows and adjacent surfaces to prevent overspray of paint, etc. It’s up to you which painting technique you use…be guided by your existing roller shutter and walls…and skill level! Stay tuned for our next chapter in the ‘rejuvenation’ series – the wait won’t be as long this time, we promise! Shutter Rejuvenation, Chapter 2, Accent Slats Continued! In our last blog we started looking at options for homeowners to spruce up older or out of style roller shutters. For roller shutters with ‘accent’ slats, there are a few options to change the contrasting colour in your curtain. One option is to replace those individual slats with the contrasting colour. While this may still result in a slightly different shade of the new slats, it can really help to remove dominant accent colours for an overall lighter look. 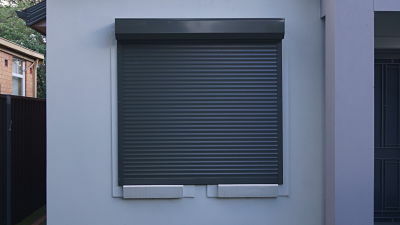 Depending on how your shutter was made, you may also have the luck to have sufficient slats in your curtain to enable a change-out of upper slats to replace the coloured accent slats. 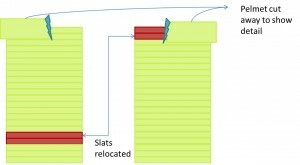 For example, if the curtain is cream with 2 heritage red accent slats in the lower third of the shutter, the two red slats may be repositioned on the curtain to be closest to the axle at the top of the curtain; and the two cream slats at the top of the curtain moved downward so that the visible part of the curtain is only cream slats. It’s hard to explain – check out my diagram! This option won’t be available to everyone, and will depend on whether your roller shutter has those “extra” couple of slats. Also, if you have too many accent slats, it’s very unlikely there will be enough extra slats to replace the coloured accent slats. There’s unfortunately no guarantee that you will have sufficient ‘extra’ slats to do this, even if you only have 2 accent slats. You’ll need to check what your shutter has before banking on this solution. Again – remember – no painting of slats! Instead, stay tuned for our next article for yet another option for revamping an older roller shutter curtain!